An electrified net, capable of capturing Namor, even at peak strength. A gamma device, which could mutate people into ape-men, or fire a gamma beam powerful enough to drop the Hulk...even when he was pretty p.o.'ed. An Inertia-Ray, able to remove all inertia from an object, bringing it to a sudden and non-traumatic stop. The Omni-directional Beam, aka the Sonic Magno-Directoid, was a military weapon which would allow the user to control the trajectory of any underwater weapon. It was most likely destroyed when Barracuda activated it and pulled a torpedo towards him and his crew. The Glove of Asteria, a highly destructive gauntlet able to generate superfast battering rams of air. An energy-charged scimitar that could cut cleanly through almost anything. The Proteus Horn, an Atlantean relic (sometimes red, sometimes white - are there multiple horns or is it just a custom paint job?) with which the user can summon and control the various monsters and mutates of the sea. Among these mutates was one of the offspring of Giganto. Presumably, a number of these creatures are Deviant mutates. (Strange Tales I#120) - Barracuda and his crew boarded and attempted to loot the Gotham Boat line, which was a daily cruise through Manhattan. Unfortunately for them, both the Human Torch and Iceman were present on the ship. Although it took them much longer, and the crew, armed with nets and the like gave them some trouble, the heroes eventually corralled the pirates. Barracuda took Dorrie Evans hostage and attempted to flee, but he crashed into an iceberg, courtesy of Iceman, and he was arrested. (Sub-Mariner I#10-11) - Captain Barracuda and his crew inadvertently captured Namor, alongside Karthon the Questor, who had been battling over the Serpent Crown. Barracuda had the two men bound while he claimed the Crown for himself. He then had his crew use an Inertia-Ray to capture an "American Bomber--carryin' a new kind of atomic warhead!" Namor eventually broke free, but Barracuda fired a torpedo at a nearby American Navy ship, and Namor took off in an effort to save it. As Barracuda planned, the military mistook Namor's intent and attacked him. Meanwhile, Barracuda had the distraction he wanted so that he could steal the "Sonic Magno-Directoid", with which he could control the path of other ships, torpedoes, etc. However, in the process, Barracuda unwittingly activated the device, pulling one of the Navy's torpedoes into his ship--seemingly killing them all. (Incredible Hulk II#220(fb)-BTS) - Barracuda discovered an abandoned undersea base, formerly used by Captain Omen. Barracuda adopted the base as his own. (Hulk II#219-220) - In search of a missing gamma ray-powered weapon, Barracuda's sensors locked on a ship with a high gamma ray level. The ship contained not the device, but the Hulk. However, when Barracuda's men torpedoed the ship, the Hulk was knocked into the water, and ended up washing up on an island. There the Hulk found a man calling himself Robinson Crusoe, who was one of those who had developed the device. Barracuda's men ambushed them, used the device the take out the Hulk, abducted Crusoe, and used the device to mutate him into an ape-man. However, the Hulk recovered more quickly than they had thought and stowed away on their ship, following them to Omen's old base. The Hulk freed Crusoe the ape-man, but again fell victim to the gamma-weapon. Crusoe, however, savagely attacked Barracuda, and then activated the gamma weapon, turning all of the crew into ape-men. Crusoe sent the unconscious Hulk off in an escape shuttle, and then activated Barracuda's conveniently located and labeled self-destruct device--seemingly killing them all. (Fantastic Four I#219) - Barracuda's crew assaulted Atlantis and stole the legendary Proteus Horn. Using the Horn, Barracuda then summoned a large number of deep-sea monsters and commanded them to attack Manhattan, while his men looted the city. Barracuda went mad with power, thinking his control of the monsters made him invincible. Namor and the Fantastic Four battled the monsters, and then Namor punched out Barracuda and retook the Proteus Horn. (Vengeance of the Moon Knight#10 (fb)) - Aligned with the murderous Black Mast pirate crew, Captain Barracuda hijacked seagoing tankers, usually killing the entire crew. He also acquired the highly destructive Glove of Asteria, apparently from Norman Osborn. (Vengeance of the Moon Knight#10) - Steve Rogers assembled a team to take down Captain Barracuda which included Moon Knight, Ant-Man, Beast, Black Widow, Valkyrie and War Machine. 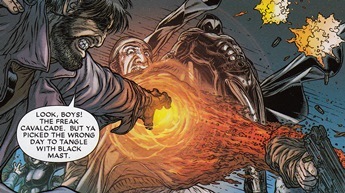 During the team's attack, Barracuda fired the Glove wildly, killing many of his crew by mistake before ordering the remaining hostages be killed. The Glove fell damaged in further battle, so Barracuda used the Proteus Horn to summon deep-sea monsters, diverting Rogers and his team, but also causing the oil tanker to sink. Moon Knight organized the escape of the survivors and his comrades, but Barracuda sunk below the waves still clutching his Horn. 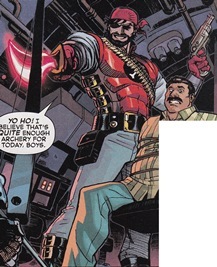 (A+X#8/2) - Captain Barracuda kidnapped renowned Mexican food chef, Hector Herrera, aboard his submarine in an underground cavern below New York City in order to force him to be his private chef. Hawkeye and Deadpool arrived, overpowering Barracuda's pirates, then confronted Barracuda in his submarine. Barracuda, proud of returning from seeming death, sliced off Deadpool's arm with his energy-charged sword before Hawkeye swiped the weapon away. About to blow the Proteus Horn, Deadpool jammed his dismembered arm in before it could sound and Hawkeye knocked the pirate out. He was presumably taken into custody by the nearby NY police. Profile by Snood. Moon Knight & A+X updates by Grendel Prime. Barracuda, the song by Heart, the hardest rocking women in the business. 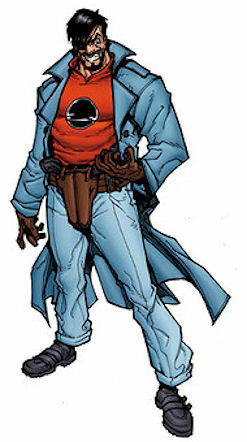 Captain Barracuda used funds from a black market sale to buy the Glove of Asteria, apparently from Norman Osborn and plundered from Project: PEGASUS. The (left-hand) glove could produce a directed column of air moving at near-light speed; it could strip flesh from bones, which is how Barracuda used it. He had bad aim and used it during his time with Black Mast. It fell off damaged during his fight against the Avengers. Its remnants likely vanished into the sea when Barracuda's boat sank. Starkey was Captain Barracuda's first mate. While Namor was held captive, Starkey wisely attempted to taunt him by hurling a bucket of water on him, thus giving him the strength to break free. Starkey was also part of the effort to gain the gamma device, and was turned into an ape-man by it. He got better, though, and was also involved in the plot involving the Proteus Horn. He was captured by the police after that adventure. Captain Barracuda used a regular submarine and motor boat in his assault on the Gotham Boat Line. The submarine which he used to capture Namor was presumably destroyed when the Omnidirectional device attracted a torpedo. The submarine with which he stole the gamma device was in Omen's former base when the Crusoe ape-man detonated the base. The submarine used in the assault on Atlantis may have escaped destruction, as Barracuda's crew left it to invade Manhattan--where they were all captured. Captain Omen's base was abandoned under unknown circumstances, and taken up by Barracuda and his crew. It was destroyed when the Crusoe ape-man activated its self-destruct mechanism. The Sea Captain is a creation of Matt Groening, and is � and ™ property of Twentieth Century Fox Film Corporation. Used without permission.